Is there a way for me to change just the color of the scroll so it would be more visible without changing the style? I have not come across an easy way to change the color of the scrollbar. By easy, I was referring to CSS. As we all know, CSS is the only feasible way to make tweaks in DV templates. Scrolling side bar works but I am having one problem with it. I have about 100 posts on the page. It works great until I select an item in the side bar. Once I do that, the sidebar scrolls to selected location and I can then no longer scroll all the way to the top of the blog. Any suggestions? Hi there.. Mind if I take a look at your blog? I'll see if I can come up with a fix. Hello.. What's your blog's address? Here's where it breaks: use the scrollbar to go all the way down to the bottom of the list and click 'Test post'. You'll notice the post becomes highlighted and scoots up a bit. What also happens is that the slider in the scrollbar disappears... so how do you get back up to the top of the list? I've just had the chance to look into this, but I'm afraid I don't have any good news. We can make the scrollbar appear when the blog loads, but when the bottom posts are viewed, the 'overflow' condition is no-longer met, and thus the scrollbar wont load. Thanks for taking the time to look into the issue. Incidentally, I owe many of the tweaks you saw on my blog to this excellent site. so, if you say that's how it is, I believe you! That I have noticed before. It doesn't work well when you use with hover :( At this point I'm afraid the scrollbar better suit as a cosmetic blog element - not so much for the functionality. How to adjust the orientation of the image on my blog. ie how to bring the image to more centre.. Also tell me how do you feel after seeing the blog. The theme of the blog is to share knowledge and awareness on Indian policy and Services. I'd say you have a nice blog going, though you should post more often if you wanna increase your blog's traffic. And here's how you can center your header image. Go to Dashboard - Template - Customize - Advanced - Add CSS - paste the following code - Press enter after the last character of the last line } - Apply to Blog. Is there a way to add scrollbar to a single page? You might wanna consider placing your gadget dock on the left, instead of the default right position. And something else. Is there any possibility to replace the default comment form with another? As for the default comment, unfortunately, there isnt a way to change it at the moment. Oops.. Sorry for not including the instructions. Dashboard --> Template --> Customize --> Advanced --> Add CSS --> paste the code --> Press enter after the last character of the last line } --> Apply to Blog. How do I increase the width of the sidebar so pictures and texts will be clearer. Also, I applied your valuable Instructions on how to show the background of my template which I customized myself, it worked but I noticed texts on main page were off the page and invisible in the background. Any tips of getting it sorted? Yoboy for President! I looked at your blog and tried searching for the main page text problem but I couldnt find what you're describing - probably I'm looking at the wrong place. Could you provide me a annotated screenshot of the issue? I can't see anything transparent in your post, and your text is perfectly readable. What am I missing? Do you think you can get in touch with me via email? Go to my Google+ page and send me an email via the link on the right hand column.. I had a question, is there a way to reverse the order of posts in the sidebar view? IE list the oldest first and the newest last? There isn't a feasible way of doing so at the moment. The only way I can think of is by editing your posts one at a time, and changing its publish date so that the older posts have a date far to the future, and the newer posts towards the past.. Gotta do it manually, and the original publish date won't be present anymore..
No Problem Yoga! Thanks for your time for sure! 1. I want to delete the new sidebar on the right. 2. I want to delete the "send feedback" button down left. 3. I want to delete the Posted By & Author in each post. Hi Yoga, I've been finding your tips very helpful lately for my iPad game review site (www.ipadgameratings.com). I ended up switching to the Sidebar view and adding the scrollbar like you instructed, however for some reason the scrollbar doesn't show up when viewed from an iPad. Any fix for this? Also, while we're on the topic, I've noticed that Blogger's Dynamic Views really don't scroll well at all on the iPad. Have you explored this issue at all? Is there a way to force the mobile version of one's site when viewed from an iPad? I'd take a look but I don't have an iPad.. Have you tried approaching the Blogger Help Forum? Create a thread there, and I will forward it to the Blogger's team on your behalf. Get back to me with your thread link once you've created a thread. Yoga, I have a question for you. 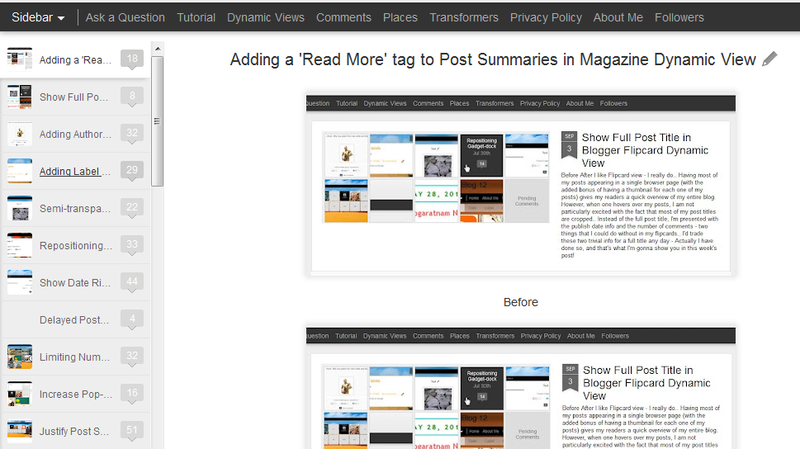 On my photo blog at www.rotatingstills.com I'm using the Dynamic View Sidebar Template. As mentioned above, some photos are loading to the left. On my 13" MacBook Pro it looks great, nice and centered. On a 21" iMac, the appearance is on the left. How do you remedy that? I've only got a single screen here so I cant quite picture the differences that you're seeing. Could you send me two screenshots, one from each machine? Hello, the CSS does not work? It's still working. Let me have a look at your blog. What's your blog's address? Thanks for the post. I have added the CSS. But the scroll bar is not working. It doesn't seem like the code got saved. Could you double check your 'Add CSS' box and make sure your code is there, even when you close and reopen your browser? 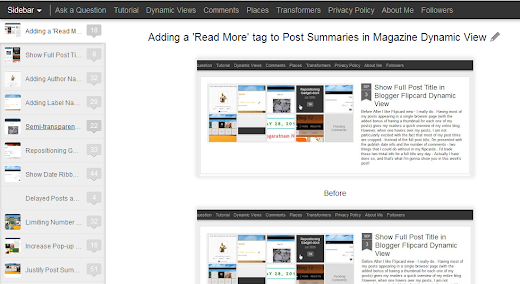 Blogger has incorporated an invisible feature that allows the posts to be scrolled through on the sidebar. When this is used (that is, when you point your cursor on the sidebar posts and start to scroll), the scrollbar that you've added from the tweak above will still stay at top. Unfortunately, this built-in feature is so invisible, that it is not possible to disable it. The only way to make full use of the scroll bar is by clicking and dragging it. Approval for an Adsense application lies within the hands of the Adsense team, not ours. My Blog displays only 25 posts in the Dynamic Sidebar View; where actually i have more than 50 posts which were displaying properly till last week. Could you please help me out to display all the blog posts in my blog? I can see all of your posts, with your oldest post being "Sketch : हम आपके है कौन?". Have you tried clearing your browser's cache/cookies? Hey Thanks Yoga, but now when i cleared the Cache/cookies and opened a fresh new browser session; still i can see only 25 posts? Can you please help me out? Also, if you clear the cache, restart the machine; and re-open the blog; you'll see the scroll-bar vanished and all the posts being displayed; but then if you close that browser and re-open the same link(my blog); the scroll-bar comes with only 25 posts being displayed. Could you please help me out in this case? Only 25 of your posts will be loaded when your blog loads. To see the rest of your posts, scroll down till the 25th posts, and after some time, the list will re-load itself and you'd be able to the rest of your posts. I scrolled down till 25th post and still i was Not able to see the remaining posts; do i need to make any configurable changes? Thanks Yoga for your valuable support and prompt co-operation; truly appreciated. My static pages have scrollbars by default, even when the text doesn't go past the bottom of the page. Is there any way to hide the scrollbar when the page isn't long enough to use it? If we disable the scroll bar for a page, it'll be disabled for all pages, even if the page is long. We can't dynamically determine if a page is long enough for a scroll bar or not, unfortunately. Can you help me to change "background color, text color and text size & font" of the SIDEBAR in dynamic sidebar view ? ie, changes for sidebar alone? Also, can we change colour, size, font of gadget dock? And can we prevent autohiding of the gadget dock? Hi, I have thought that maybe you can help me with my problem. When I am on my blog I can scroll down the page normally when I am on my "Home" site, however, when I am on my other sites I have a problem... I cannot go down the page, scroll it down.. and this creates a lot of fuss for me cause I cannot post new things on other sites which I categorised cause the reader will be unable to read the content, scroll down bar is simply invisible, and when I try to click it it takes me back to my Home page, is it a general dynamic view problem??? Could you point me to one of your other sites that you're referring to, so that I can have a look at what's wrong with your page? Hi Yoga! At the sidebar the posts appear from the new to the older one, can I twist it? So the older one appears at the top? This is a classic one, but unfortunately, there isn't a way to do so (except to edit your posts one by one and manipulate the dates so that the older posts will show at top, which is a pain in the neck as you can tell). Hi if i want another sidebar then the one i have now i want a bigger one and so u can see my profil pic on the site like in other templates how do i do that? If you're using a Dynamic template, I'm gonna have to stop you at 'another sidebar' - it just isn't possible. Your blog is really awesome and useful! Thank you for your effort! Since you know infinitely more than me (and I'm sorry if my question is dumb), but even with the scrollbar (also without), the posts start to overlap each other in the sidebar. This especially happens with posts that have comments on them (mostly from 2011). So post titles from Nov 2014 are in the same space as posts from Nov 2011 and it's impossible to decipher them. I've no idea why this is. Looks like a bug to me. Have you posted this in Blogger Help Forum? This may need an escalation. Do provide me a link to your discussion in the help forum if you've already posted there. I tried replicating this but I wasn't able to. Could you remove the sidebar code and get back to me? hi and thank you sooooii much for everything firstly ! 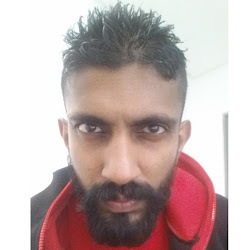 Montronix.. Looks like this will be a lengthy discussion. Let's bring it to the forum (use the 'Ask a Question' link above). Your sidebar extends all the way to the bottom of your blog. If you set it on a fixed position, you will essentially clip off the bottom part of your sidebar.